Spencer: So far Grant Morrison’s The Multiversity has been chock-full of ideas and meta-commentary, but while the first issue was essentially a celebration of everything comics offer as an art form, The Multiversity: The Just 1 explores much more critical, perhaps even cynical takes on the medium. Fortunately, it’s just as dense, thought provoking, and flat-out bonkers as the issues that came before. The story takes place on Earth-16 (referred to as Earth-Me within the issue), a world where the Justice League has eradicated all crime and an army of Superman robots protects the planet. It’s a utopia, but it’s left the children of the League with little to do besides become shallow, spoiled celebrities — that is, until Megamorpho commits suicide. Batman (Damian Wayne) and Superman (Chris Kent) lead an investigation and eventually discover that ultra-dimensional conquerors are using comic books to infect and possess readers across the multiverse, including Damian’s girlfriend, Alexa Luthor, who spitefully takes command of Superman’s robots and terrorizes the practically helpless planet. Perhaps the most prominent theme running through the issue is the concept of ironic detachment. At one point Damian flat-out proclaims “Nobody cares about anything anymore,” and, at least on Earth-16, this seems to be rather true. Heroes and civilians alike can barely muster up enough interest to take a passing glance at extraordinary threats that would probably anchor line-wide events in the current comic climate (and lead to mass hysteria here in the real world). Alexa doesn’t dare show genuine interest in the comics she reads — she’s interested in them for their gimmicks, with Damian even throwing out “hipster” as the only apt description of her. This is all an obvious rant against current trends both in comics and society in general. It’s easy to see the spoiled superheroes as counterparts to spoiled celebrities (Arrowette is almost certainly based on Miley Cyrus) and the vain, self-centered culture that has spawned in their wake, distracting society-at-large from more weighty matters. Damian’s complaint about how comic companies treat artists is always a pressing issue (there’s two separate acknowledgements of Jerry Siegel’s involvement with Superman and Superboy in the credits as if to remind us why), and both Alexa’s attitude towards the comic and Damian’s scoffing about the name “Picto-Fics” seem to be calling out the way some comics use cheap gimmicks to attract attention, be it quick-to-be-reversed deaths or holographic/variant covers, or even calling comic books “graphic novels” as a way of making them come across as more mature. Alexa’s very first line is even a question about whether comic books qualify as an art form, and based on Alexa’s dismissive tone and Damian’s brushing-aside of the question altogether alongside everything else I just mentioned, the issue doesn’t seem to have a very positive view on comic books in general. I certainly don’t think that Grant Morrison of all people doesn’t consider comics art, but I can easily see the argument being made that comics should just allowed to speak for themselves as an art form instead of creators trying extra hard to make books look mature and fumbling in the process. This issue also expands upon the story of the Gentry using inter-dimensional comic books to spread their influence, and the more cynical tone of the issue creates an especially dynamic environment to explore this within. The act of reading a “haunted” comic passes along the Gentry’s influence and affects the reader’s actions, and I can’t help but to see parallels between this and the fear that violent comics (or movies, etc.) can pass along violent behavior among young, impressionable readers. 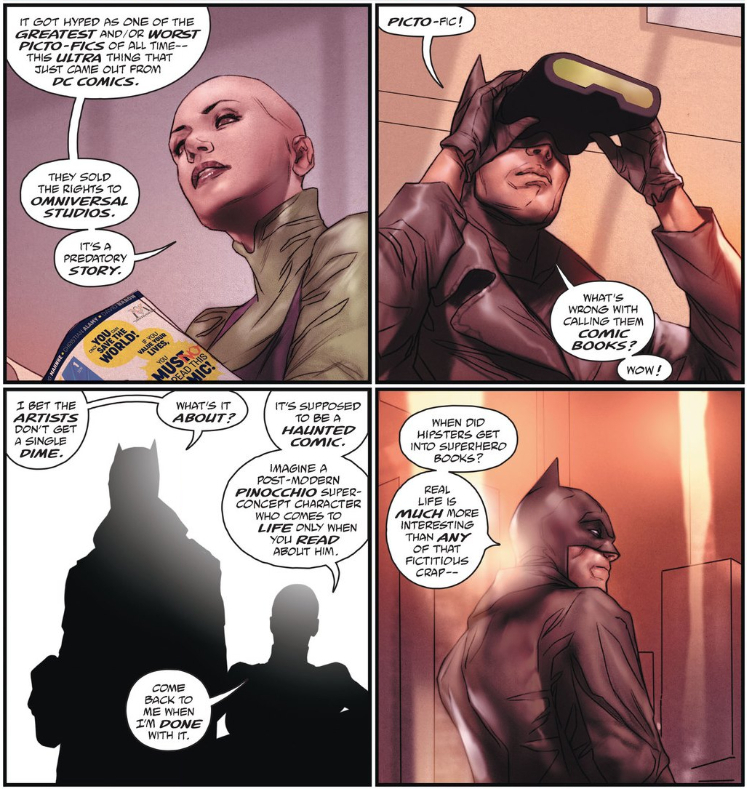 Morrison purposely keeps answers elusive; Does Megamorpho commit suicide because she’s possessed by the Gentry, or because she’s bored and sad, as Damian suggests? 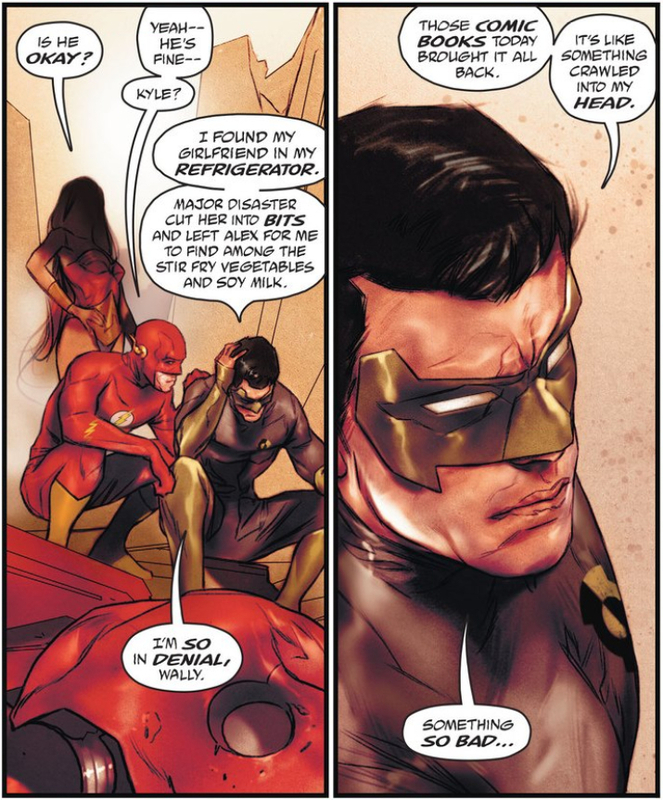 Does the Gentry purposely trigger Kyle Rayner’s flashbacks, or is this something he’s always been struggling with? Is the Gentry to blame for Alexa’s taking over the Superman robots, or would the spiteful, maligned daughter of Lex Luthor have lashed out like this even without prompting? It almost looks like the Gentry can’t make anybody do anything they don’t already have the potential to do in the first place, which certainly doesn’t help answer the question of whether reading comics can affect behavior, but it’s still a fascinating question to consider, especially since Morrison seems determined to have us confront all the problematic aspects of the medium. What a gut-punch. This is such an effective and clever way to show Sasha’s emotional response, and without her even appearing on the page! 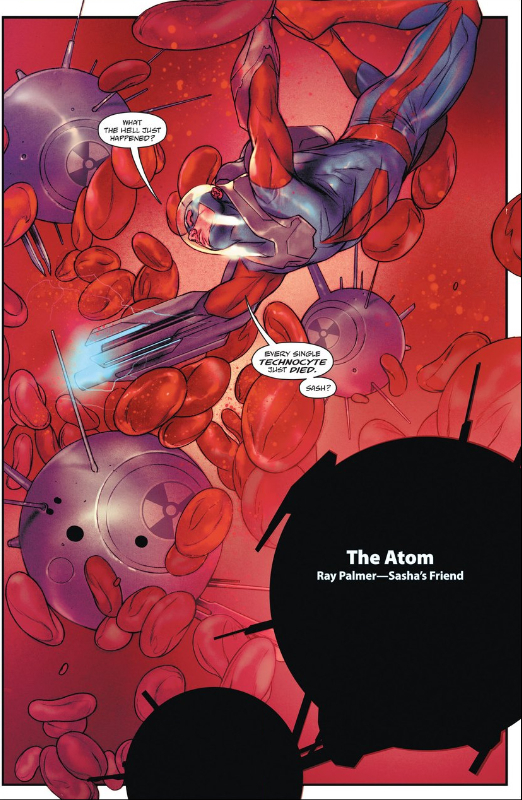 I was also impressed by the way Morrision and Oliver handle the Superman robots. Even when they’re fully in-panel Oliver still obscures the robots, indicating how they’re a constant presence that nobody pays the tiniest bit of mind. It isn’t until Alexis takes control of them, turning the robots against humanity, that we finally get a full reveal; society’s paying attention to the robots now, but it’s far too late to stop them. Mike, if I don’t shut up now I’ll probably never stop rambling. This is such a dense issue that I’m sure you have plenty to talk about, but I’m particularly curious what you think about the issue’s more cynical, possibly dismissive take on comic books and the superhero genre. Even the idea that superheroes doing their job to the best of their ability would make the very concept obsolete while also weakening Earth’s defenses is pretty grim, but I’d love to hear your take on it all. Michael: As we all know, Grant Morrison has made a career out of commentating on comic books and superheroes, both in comics like Animal Man and prose like Supergods. This is the latest chapter in his ongoing comic reflection and honestly it might be my favorite Multiversity yet. The cover is just so damn perfect for everything that is reflected inside. You’ve got Ben Oliver’s pencils depicting tabloid headlines of versions of characters we all know and love, with tongue-in-cheek references to comics history and celebrity culture. Multiversity: The Just is of course a commentary on comic books but it is also a commentary on entertainment in general. In the strangest utopia ever, everyone is bored to the point of complacency. Characters have no true convictions; they just act how they perceive they should in a given situation. Damian Wayne as Batman talks at lengths about how everyone is bored when he himself is the prime example. The greatest crimefighter is so full of ennui that he has taken up with the daughter of one of the greatest criminals (against his best friend’s wishes) to spice up an otherwise dull life. 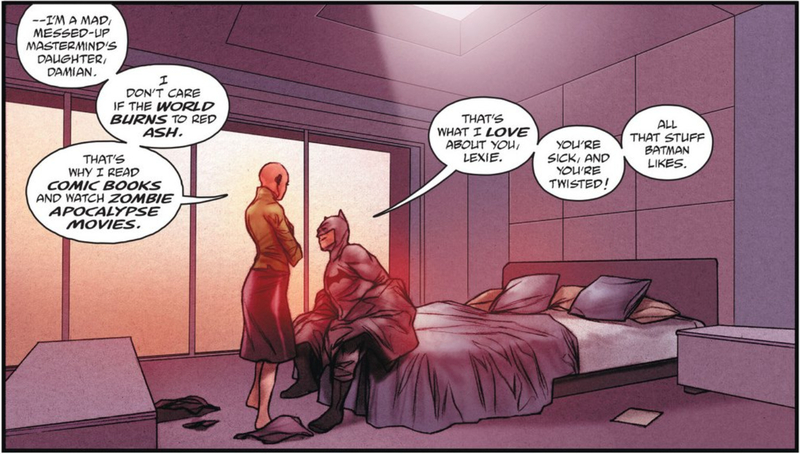 He even justifies why they’re together, noting “You’re sick and you’re twisted. All that stuff that Batman likes.” The characters are so ambivalent that they don’t actually know how to properly address their emotions. Superman and Batman actually call each other out at one point for their own ambivalence. Batman doesn’t care that much about Megamorpho’s death and Superman didn’t actually know that her real name was Sapphire. Then you have the scene where Batman attempts to confront Offspring (great character pull from Morrison btw) about Sapphire’s death and he couldn’t care less. He’s more concerned about his video game. One of the best parts of this issue for me was what is severely missing from The New 52: legacy heroes. Besides Ray Palmer, this issue is chock-full of characters inheriting their mantles, both old and new. On the surface you have a story about children not being able to live up to their parents. The heroes that came before were SO good that there is nothing to do in their wake. So the best option is to be a celebrity for celebrity’s sake. More on that in a minute. What I love about this issue is the character choices that Morrison makes. As a comics historian, Morrison uses Kyle Rayner as a symbol for all of the overhyping and shocking plot twists of the 90s. He even gives an abridged (altered) history for how Kyle’s girlfriend was brutally murdered. Kyle then goes on to comment how comic books are so violent these days, which is so ironically beautiful. Later we find that Kyle is still very severely damaged by his past – perhaps due to the comic book demon/virus/McGuffin. Back to the nature of celebrity: this is not the first time that Morrison has used superhero teams as ultra-cool celebrities — Final Crisis’ Super Young Team comes to mind. This is the post-post-postmodern approach to superhero: mega fame. Arrowette doesn’t actually want to fight crime; she just wants to “earn her arrows” so she can achieve a status symbol. Seeing her and her atavistic father go at it was entertaining. These are “heroes” that just want to be saved from their monotonous lives. They welcome a planet-wide catastrophe because at least they’ll have something to talk about. All of the great adventures are behind them and all that’s left is their own self-importance. #party to end all parties. Michael D. is a Film School dropout with a penchant for TV, Comic Books and Ties. Batman was his gateway drug into the comic-verse and he now has Brainiac levels of knowledge about superheroes, multiverses and Bat-Mites. Follow Michael on Twitter @CormacMichael and his blog Mike’s Masterpieces in the Making. Mike, I’m with you 100% about being happy to see the legacy heroes again, as they were my favorite part of the Pre-New 52 DC Universe. Getting to see Morrison write Damian Wayne and Kyle Rayner again was awesome, but I think my favorite appearance was actually good ol’ Impulse, who only gets a one panel cameo but who still absolutely steals the show. You also raise an interesting point about the contrast between Connor Hawke and his daughter, but for all his monk-like ways, even Connor seems to be losing his meditative, spiritual way and is instead becoming more secular (look how concerned he is about his date with Lady Shiva, when before Connor was practically asexual). It’s not necessarily a bad change, but it’s an interesting change nonetheless.